Is it just me or are there literally babies everywhere? Everywhere I turn someone new has a baby or is pregnant. This is great for me, because it means I’ll have lots of babies to visit! I think it has to do more with the time in my life (I’m barely a week from being 26), than just a sheer coincidence that so many people around me are expecting. I have a new friend I’ve just gotten to know within the past year or so, who discovered she was pregnant. WITH TRIPLETS. Yes. Three babies in her belly! Melissa and her husband moved for his job, and haven’t been living in TN very long. All her family and friends still live up north. She was discussing how they were having a shower for her at home, but she couldn’t travel. Well, I don’t know about you, but I don’t think it’s fair to have THREE LITTLE ONES coming, and not get to attend a shower! Me, and a couple other girls she knows put together a SURPRISE baby shower. I decided to work around a “Sweet Pea” theme I saw on Hostess with the Mostess. I don’t have the time/money/skill to throw showers like they do on that blog, but it’s a great inspiration! When I mentioned this to my friend Jamie, (who is pregnant herself! ), she told me about the garden cupcakes in her Hello Cupcake! book. One of the vegetables was peas! HOW PERFECT! The shower was going to be a small affair, just 5 of us attending to so I turned to my Perfect Cupcakes book because all the recipes in the book make 6 cupcakes. 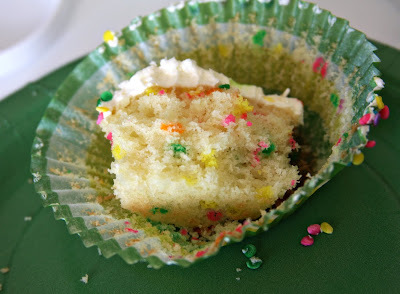 I knew I wanted to use the pretty rainbow sprinkles on the frosting, but was excited to discover a “sprinkle” cupcake recipe that includes them IN the cupcake! It basically makes cupcakes just like the Funfetti kind in a box. And you know me, I’d rather bake something from scratch than I would a box. Because this made such a small batch, I didn’t get to do a “taste-test” like I usually do, and eat one the night before, so I was worried the cupcakes would be dry or not taste good. But I was happy to discover they actually turned out great! They were moist, and sweet, but not too sweet, with a yummy vanilla flavor. And, the sprinkles inside turned out so bright and pretty! The frosting itself is now my favorite traditional buttercream. Usually buttercreams end up too sweet or too buttery for me, and this was a really great balance. I definitely recommend these cupcakes for a kid’s birthday, or any fun occasion. If you need more, just double the recipe for a full dozen. Preheat the oven to 350 degrees. Prepare a 6 cup muffin pan with liners. In a small bowl, whisk together the cake flour, baking powder, and salt. In a medium bowl, using a hand-held mixer on medium speed, cream together butter and sugar until well blended. Beat in the egg and vanilla until light. Gradually beat in half of the flour mixture. Bean in milk and then the remaining flour mixture until blended. Fold in half of the sprinkles. Divide the batter evenly among the prepared cups. Bake until the tops spring back when lightly tapped, 20-25 minutes. Cool on a wire rack for 10 minutes, then turn out and cool completely. In a medium bowl, use a hand-held mixer on medium speed to beat together the confectioners' sugar and butter until blended. Beat in the vanilla, then beat in enough cream to achieve a soft consistency suitable for piping or spreading. *I spread the frosting using an offset spatula, then rolled the edges around in a bowl of sprinkles. For decorations, Roll out each of the green fruit chews into a 3 x 1-in. oval 1/8-in. thick. (If you're having a hard time rolling out the candy, 3-7 seconds in the microwave will soften it up.) Press 3 skittles onto one side of each oval. Fold the other side over to cover the candies slightly. 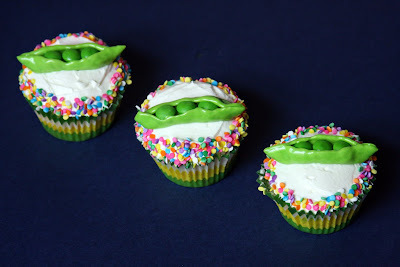 Pinch the ends and place 1 pea pod on top of each of the cupcakes. 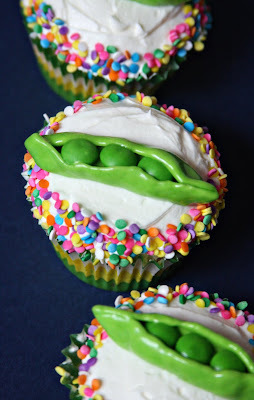 Pssst… And if you’re looking for a good salad to serve at a Peas in the Pod themed shower, check out this salad! These are SO cute and so sweet of you to throw Melissa a shower! How flipping cute!!! LOVE them! I LOVE that cookbook!!!!!!!!!!!!!!!!!!!!!!!!!!!!!!!!!!!!!!!!!!!!!!!! Very cute!!! These are so freaking cute! Nice work. Awww, these are adorable!! Everyone around me is having babies too – we have 5 little ones born or due later this year at work already (out of 8 women!). Your cupcakes turned out super cute! I'm right around the same age as you (turned 26 this summer), and I totally agree that it was like a switch was turned on and everyone I knew started having babies! Not my local friends as much, since we live in a big city and most aren't even married, but my college friends in Missouri and high school friends in Colorado have been popping them out left and right! These cupcakes are beyond adorable. And I seriously need to look out for a copy of that Perfect Cupcakes book, because the smaller portions are such a good idea! My heart skipped a beat when I read that Jamie was pregnant! Whew! Not me! I'm way past 26! But I would still love someone to make these incredibly cute cupcakes for me. They are perfect for the party and too cute! Great job! These cupcakes were adorable – they were almost too pretty to eat – but they were delicious. Thanks again for the wonderful shower, everything was awesome!! That is the coolest thing ever. 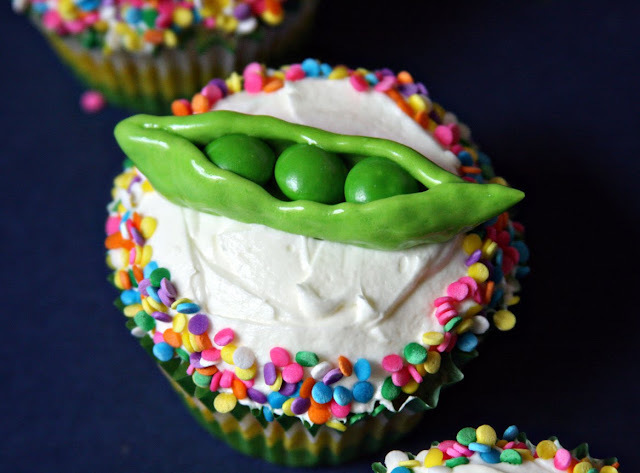 Love the idea of making a rainbow speckled cake batter, and the peas are the shizzle. I have a friend (who is a twin) who is obsessed with getting her 5-a-day. These are so getting made for her! These are too cute Erin! I am going to have to make these for someone!! !